Celebrate St. Patrick’s Day with a classically stuffed boxty. An Irish Corned Beef Boxty is a potato pancake which is filled with tender corned beef and lots of melted Swiss cheese. Does March come in like a lion, and out like a lamb? Or, does it come in like a lamb and go out like a lion? I always get those two mixed up. Kind of like starve a cold and feed a fever, or feed a fever and starve a cold? I’m never quite sure. But what I am sure about is how delicious this Irish corned beef boxty is. 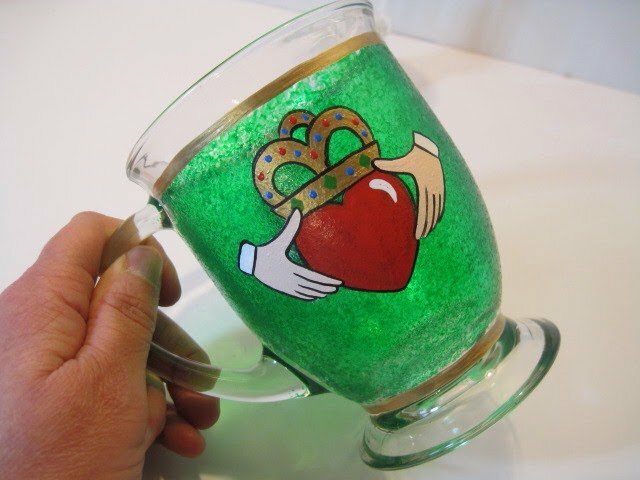 Make one for St. Patrick’s Day and it’s sure to be your lucky day! 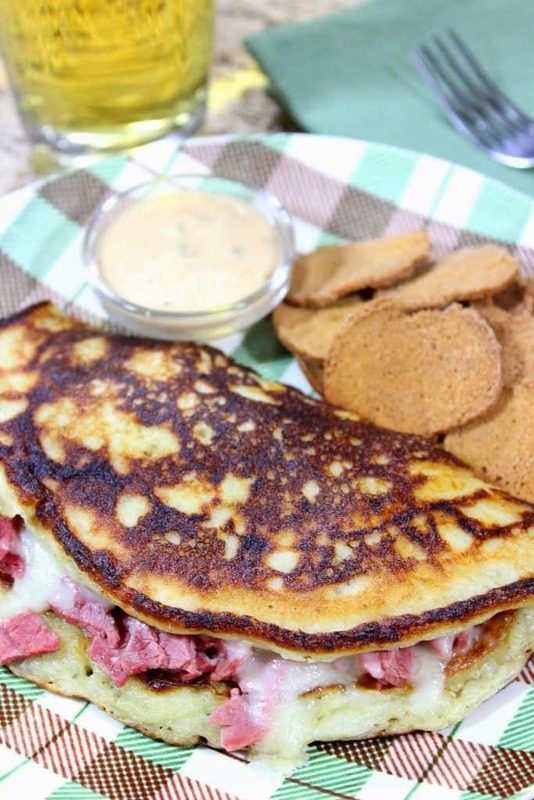 **Please Note – The printable recipe card with detailed instructions, complete ingredient measurements, and nutritional information for making Irish Corned Beef Boxty is available near the end of this post. It’s been such a brutal winter for most of the country with record-breaking freezing temperatures and record-breaking snowfall. Is this now what winter is destined to be? I sure do hope not! However, two things you can always count on of in the month of March (despite the weather) is that college basketball takes center stage (with anyone and everyone talking brackets). And, on March 17th (St. Patrick’s Day) everyone turns a little Irish, including me! 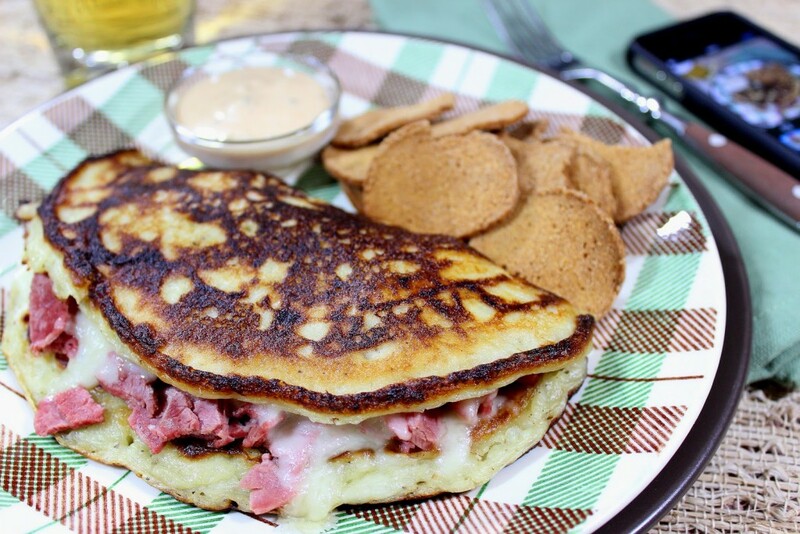 Eating a delicious corned beef boxty is a great way to celebrate being Irish for a day! In a large bowl mix the mashed potatoes and horseradish. 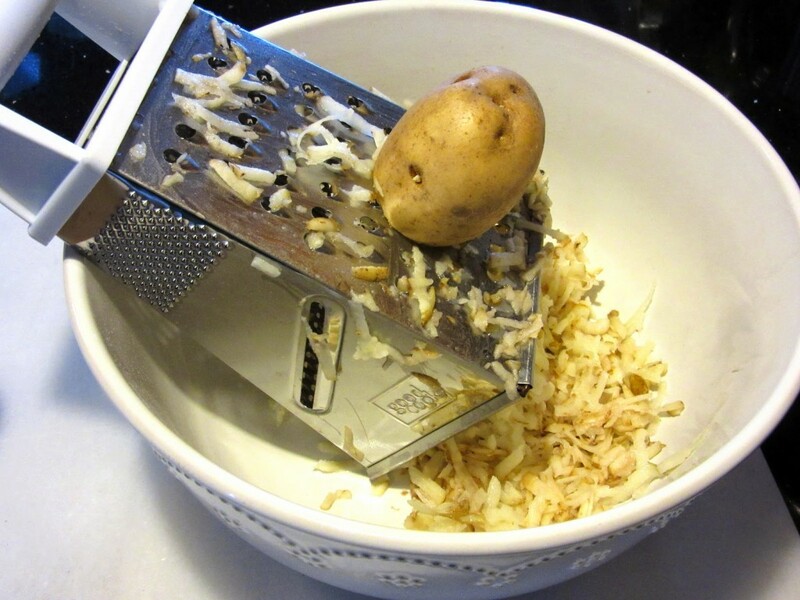 Grate 2 cups of Idaho potatoes (I leave the skin on), and dry them in a clean towel by squeezing out all the moisture. 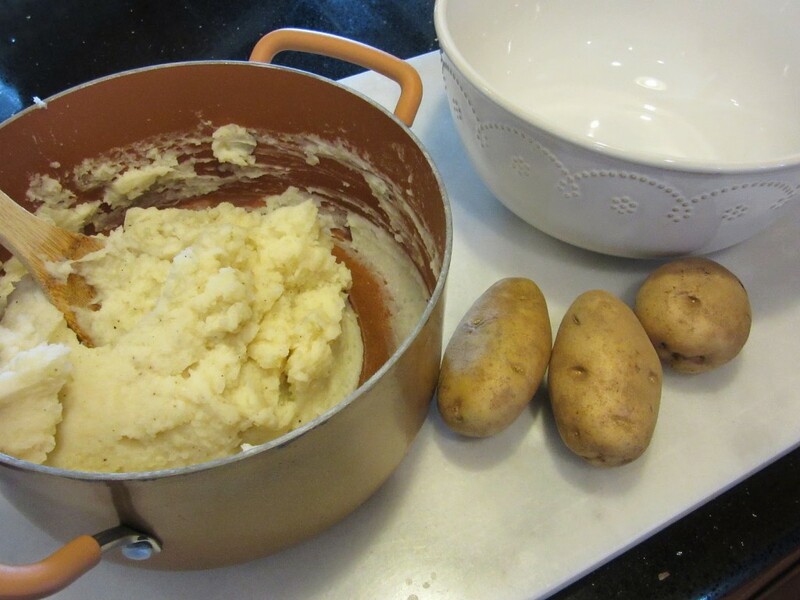 Add the dried grated potatoes into the bowl with the mashed potatoes. Stir in flour, baking powder, salt, pepper and mix well. 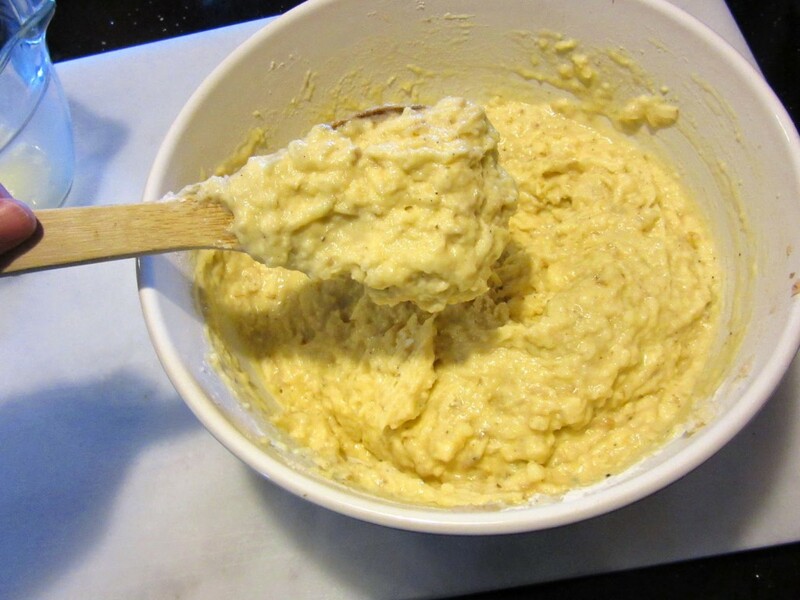 In a small bowl whisk together eggs and milk. Add the egg and milk into the potato mixture. Stir well to form a creamy, thick pancake batter consistency. 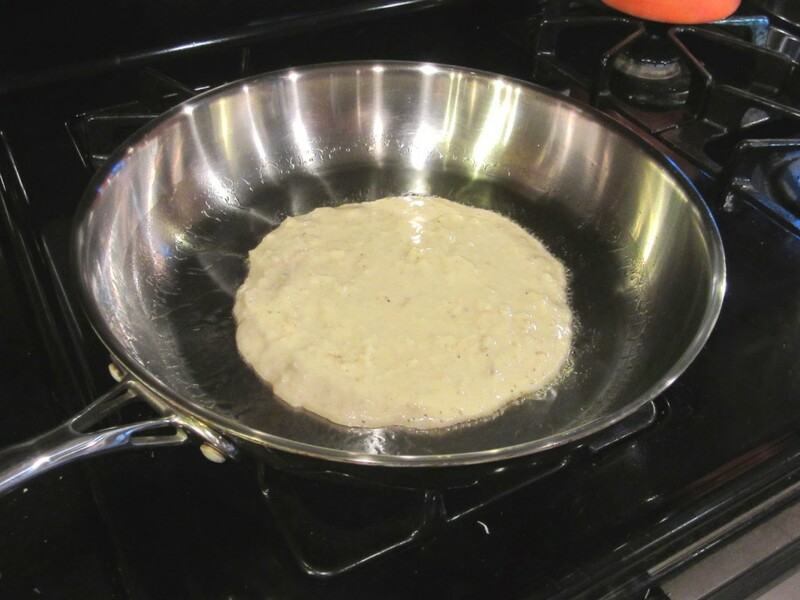 Add oil to a large skillet and drop enough batter into the skillet to form a 6″ pancake which is approximately ¼” thick. Flip the pancake and cook on the second side until browned. 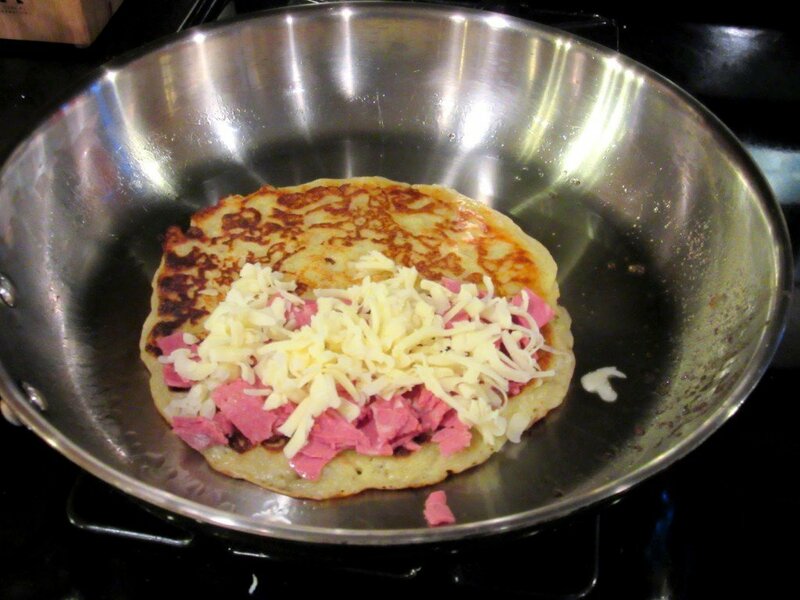 Add the corned beef and Swiss cheese to half of the cooked pancake. Use a spatula to flip the plain half of the pancake over the filled half. Cover the skillet loosely with a lid or foil and cook until the cheese has melted. Serve the Irish boxty hot, with 1000 island dressing for dipping if desired. Can instant mashed potatoes be substituted for the leftover mashed potatoes? I don’t see why not. As long as the instant mashed potatoes are seasoned well, and made to a thicker consistency, they should work equally as well as homemade. Can I swap out a different kind of meat and/or cheese for this stuffed boxty recipe? Making the boxty (potato pancake) is a method, but what you stuff it with is your choice. Go crazy and have fun! Is there a swap I can use for the prepared horseradish? Why not add some Dijon mustard or maybe even a touch of beer to the batter? As long as you thicken the batter accordingly with additional flour (so it’s not too wet), you’ll be fine experimenting! Again, have fun! 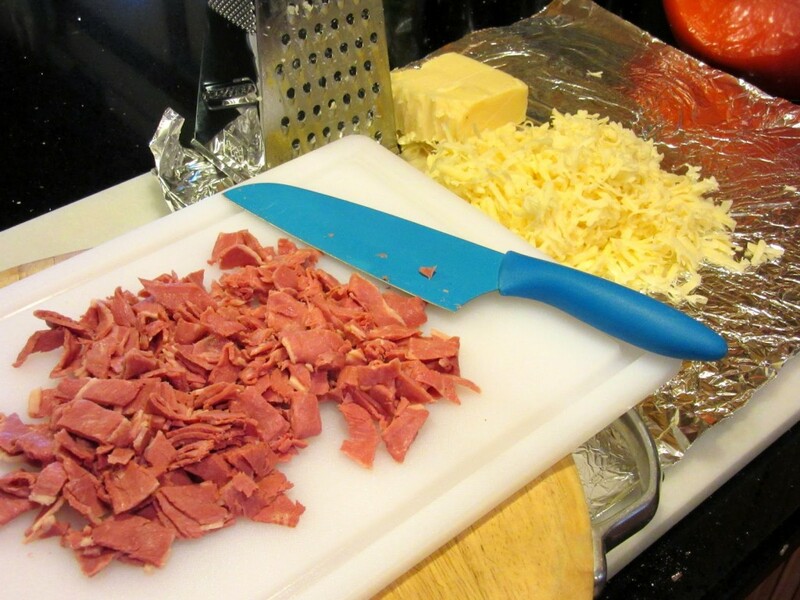 Below is the printable recipe card for today’s Irish Corned Beef Stuffed Boxty. 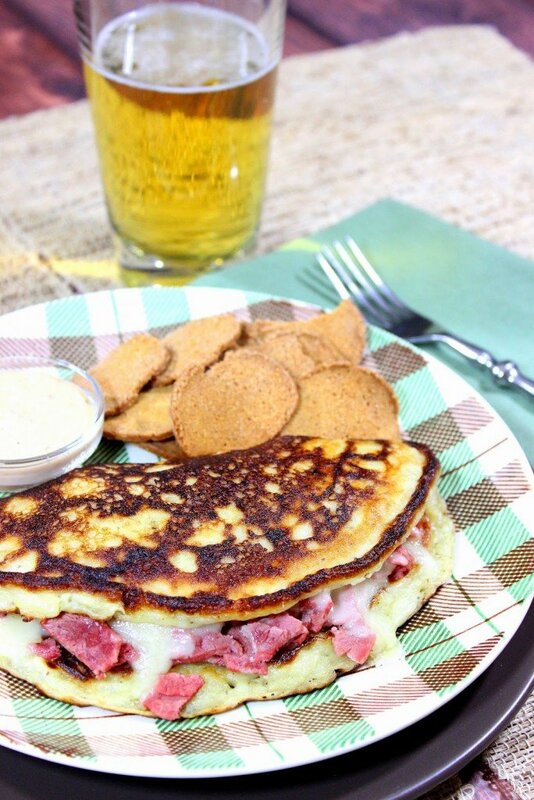 Loads of sliced corned beef and Swiss cheese is enveloped around a delicious potato pancake. In a large bowl, mix the mashed potatoes and horseradish. Stir in the dried grated potato, salt, pepper, flour, and baking powder. 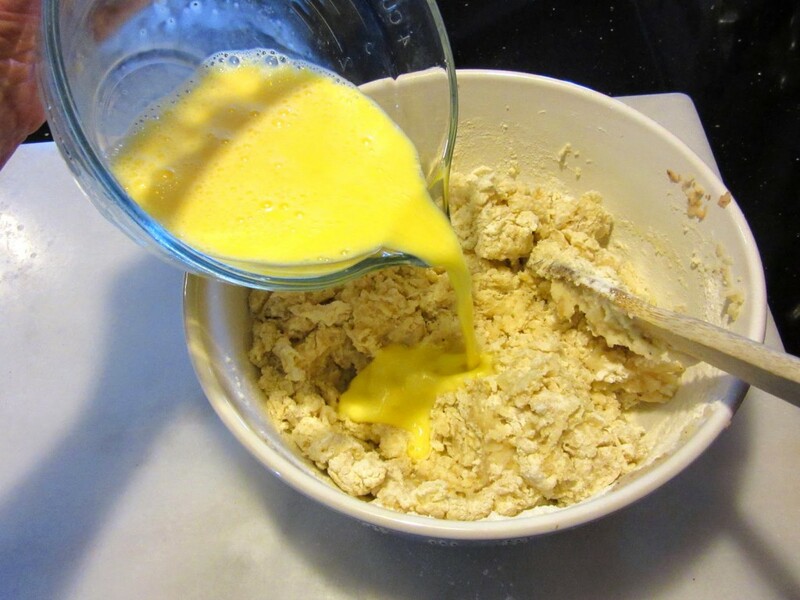 In a medium bowl whisk together the eggs and milk. Stir the egg and milk mixture into the potatoes until the mixture is creamy and has the consistency of thick pancake batter. *Note - if the mixture is too thick, add a splash of milk. Add approximately 1 tablespoon of oil to a large skillet over medium/high heat. 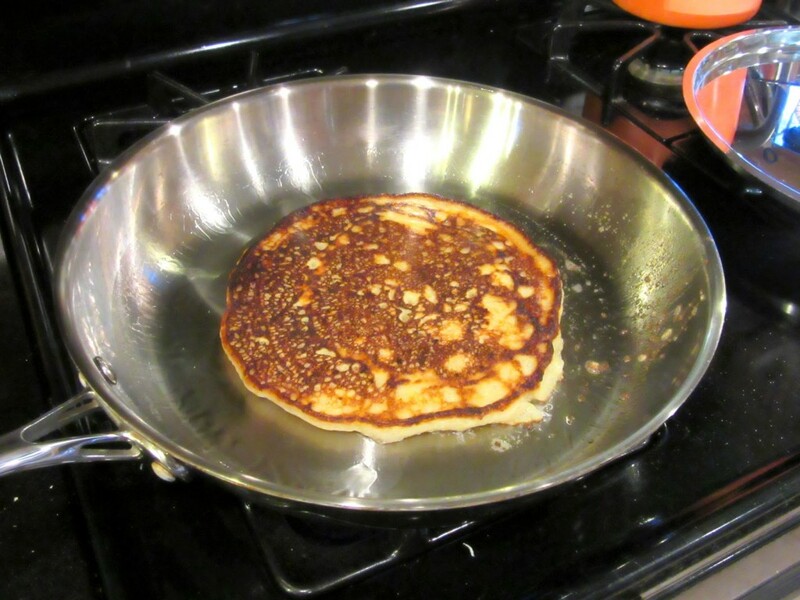 Spoon enough potato mixture into the skillet to form a pancake that is approximately 6" round and ¼" thick. *Note - use the back of a spoon to help achieve this size. Cook the pancake until golden brown on the first side and then carefully flip and cook the second side until golden. 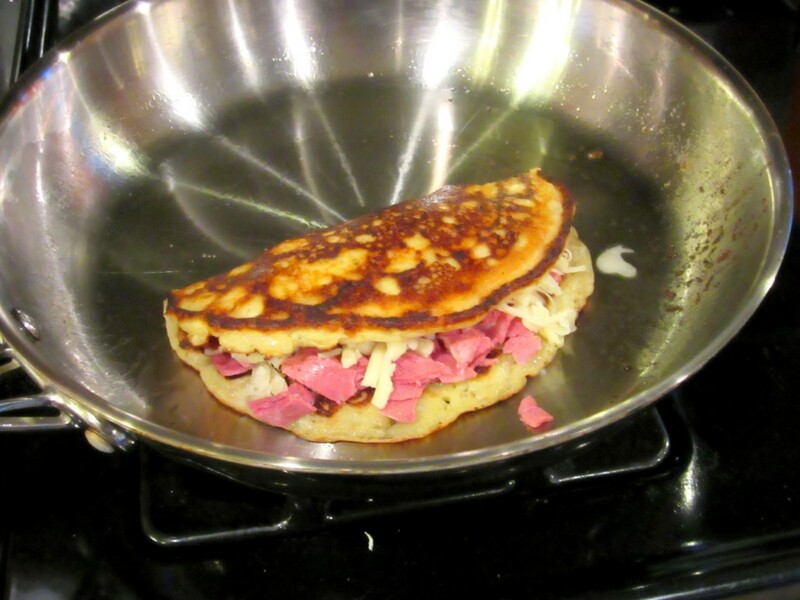 Place corned beef and Swiss cheese on half of the potato pancake and flip the plain half of the pancake over the filled half of pancake. Cover the pan loosely and allow the cheese to melt. Remove the completed boxty to a baking sheet and keep warm in a low oven while preparing the remaining boxty. I sincerely hope you’ve enjoyed today’s stuffed boxty with corned beef and cheese recipe as much as I’ve enjoyed bringing it to you. Should you have any questions or comments regarding today’s recipe or anything else you’ve seen on my site, please don’t hesitate to contact me directly or leave me a comment in the comment section below. It is always my distinct pleasure to get back to you with a reply just as soon as I possibly can! I'm not Irish either but for one day we are in our family! This is a hearty meal my husband would love! Oh wow! What a meal! It looks super tasty! I learned something new today! I've never heard of a boxty, but you grabbed my attention with the potato and horseradish combination. My mind is spinning with all of the filling possibilities for these. Me too, Dara. The filling ideas are swirling in my brain. They're endless. Oh this is the best idea ever!! I'm sooo over this winter and ready for spring! I can't wait for it to warm up a bit. I just love your step-by-step photoes…I can totally envision making this AND enjoying it tremendously! Well, I learned a lot about my Irish heritage today. Gotta have a boxty! Yours looks great! I have never had nor made boxty…why in the world not!? I love your stuffed version (because I'm a bit of a reuben fanatic). And I love that glass – so perfect. I always learn something new when visiting this blog. Love this recipe! Thank you so much, Melissa! I think that's the best comment anyone has ever given me! I love boxty potatoes!! using it as the wrap for a Reuben is brilliant. i bet this is so good! My goodness this looks good! I love the step by step instructions! How did I not know that boxty was A Thing? I love that you left the skin on the potatoes. This is definitely my kind of meal! I’ve never heard of boxty, but I totally want to try it now — with plenty of horseradish for me! Ah, a girl after my own heart. I love lots of horseradish also!! This is such a great twist on a corned beef. LOVE IT. Me too, Aimee! It’s one of my favorites. Thanks!